Providing the best care since 1978. Make an appointment at one of our locations today! Come visit our state-of-the-art facility! With a rehabilitation pool, exercise equipment, and expert staff, our physical therapy program is simply the best. Our veterinary hospital uses the most technologically advanced fertilization procedures. Hyperthyroid treatment available at our veterinary hospital locations. 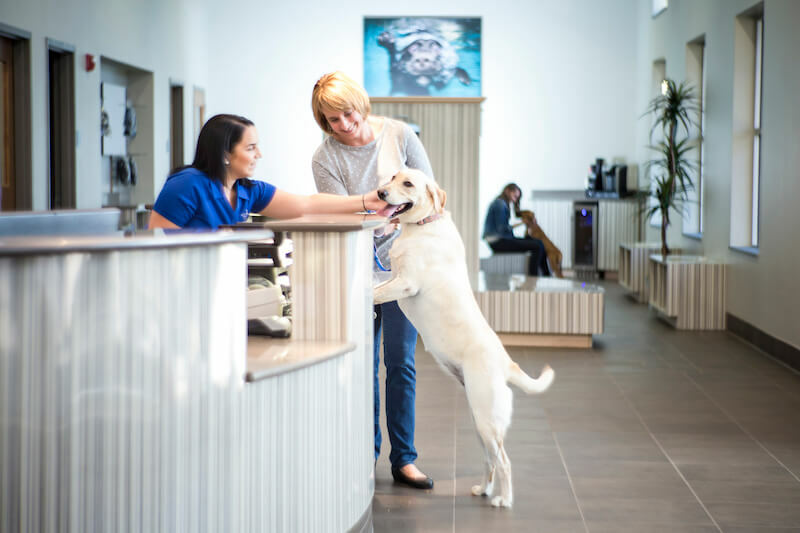 At Riverbark Veterinary Hospital, we offer advanced surgical procedures such as Orthopedic and Soft Tissue Surgery, as well as Minimally Invasive Surgery. As an American Animal Hospital Association (AAHA) accredited clinic since 1975, our team of veterinarians and support staff adheres to the highest standards of facility and pet care. Only 15% of all practices are AAHA certified (re-accreditation takes place every 3 years). However, our greatest source of pride is found in the praise of our clients and the satisfied purrs and wagging tails of our patients. At Riverbark Veterinary Hospital, our team is made up of a diverse group of veterinarians and support staff professionals who bring their love for animals to work with them everyday. Our veterinary team comes from all backgrounds, and they have joined Riverbark Veterinary Hospital because of their desire to make a difference in the lives of animals, as well as the people who love those animals. Riverbark Veterinary Hospital is an animal care facility equipped to handle all medical and surgical needs. From preventive health care services to advanced diagnostic and surgical services, our doctors and staff are trained to manage all of your pet's needs. We are continually updating our equipment and educating our team to the latest medical information. We know that everyone has a budget and we will work within the confines of your budget to get the best outcome for your pet. We have two veterinary hospital locations and a state-of-the-art pet retreat serving the Fayetteville and Spring Lake areas. We have been providing cutting edge quality healthcare to pets since 1975. We are known for being an exceptional veterinarian and having very informative staff. We set the standards in our area for what a full-service veterinary hospital should be like. We will treat your animal family members as if they were our own.